Not all water sources are created equal. While some cats may be just fine drinking from a simple bowl, others will turn to running water sources to try to get what they need. 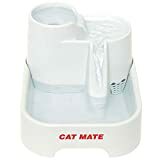 If you're looking to keep your cat out of the sink, bath tub or even toilet then providing them with their own running water source can be a fantastic option. This is one of those things that could pleasingly control your pet's behavior by providing to their needs. Like with the best cat nip products, cats can be attracted to playful things they could get their paws and jaws to. It's also the same thing with the best cat water fountains. If you pick out one with the right look, a water fountain can also be a great aesthetic for your home. The water sounds can also often be soothing for pets and owners alike. Read on to learn about some popular cat water fountain options! How often will I need to clean a fountain? What should I do if the pump stops working? What if it gets too loud? What if my cat doesn't like it? This fountain is designed to entice your pet and offer them a decent supply of fresh, filtered water. While it may be more costly than some other options available, it is decently sized and easy to throw into your dishwasher to keep clean. One of the most important aspects of this fountain is that it's made with BPA-free plastic so you won't have to worry about the negative effects that can come from drinking from a plastic container. It also offers a relatively large capacity of 168oz so you won't have to worry about refilling it as often. This can also help encourage pets to drink more water, helping them to avoid kidney and bladder problems. An aspect that can make these water fountains difficult is keeping them clean. Bacteria and other problems can easily build up in water, and it's important to make sure they get fully cleaned. This fountain makes cleaning easier by being dishwasher-friendly. For many customers, as long as it is cleaned thoroughly on a regular basis, the fountain can last a long time. While the fountain itself can be easily cleaned, the motor and pump can be more difficult. There can sometimes be a buildup of mineral deposits that may result in the pump ceasing to work. The running water is also more subject to evaporation so it will be important to make sure it is refilled as needed. You'll want to keep in mind that this kind of thing won't appeal to all pets, as some may be wary of the sounds it can make. For those who like a simpler option, this fountain has a straightforward design at a middling price so that you can get the ideal combination of cost and value. It also comes with a three year guarantee, showing customers that the manufacturer really stands behind their product. For animals of different sizes or preferences, there are three drinking sections on this fountain that sit at different heights. This gives your pet more options to enjoy so they won't get bored with the device. It's also made with an Isolated Pump System that keeps it running quietly so that it won't disturb you or your pets. It's made to allow water to gently flow without a lot of splashing. In some fountains, it can be easy to accidentally put the filter in the wrong way and get less efficient cleaning. However, with this fountain you'll only be able to fit the filter in one way to ensure that it's always correct. It also offers a long cord so you don't have to worry about placing a water-running device too close to an outlet. To clean it, you can also just toss it into a dishwasher after removing the pump and motor. There are a few nooks and crannies in this device that may be prone to building up bacteria or fungus so you will need to ensure that it's cleaned very well on a regular basis. It may also be wise to check the plug from time to time, as in some cases it can overheat and cause problems. Rarely, the pump can sometimes cease working entirely and need to be replaced. Filter is designed to only fit one way, for ease. The pump can sometimes stop working after only a few weeks of use. The plug can get very hot. There can sometimes be a buildup of bacteria in the machine. You'll get a lot of water capacity in this fountain, as it's able to hold around 1.5 liters of water. That will mean you don't have to refill it as often. It's also made with BPA-free plastic so that you can trust it will be safe to drink from. The included filter networks to create fresh water for your pet, which is fantastic if you have concerns about the water that comes from the tap in your home. Customers love that it holds a lot of water. Refilling a water bowl can get annoying if you need to do it too often. Not only does this fountain have a high capacity, but it filters the water so that you can trust it will always be fresh. The design is simple, efficient and can add a great aesthetic to your home. The design alone allows it to really stand out when compared to other cat water fountains. In order to allow for the 1.5 liter capacity, this is a little bit larger fountain so it may be heavy or a little more difficult to clean for some customers. It can also be difficult to tell when the water needs to be topped off due to the design. Also, keep in mind that not all pets are going to be interested in drinking from this fountain. Cats in particular can be rather picky when it comes to their water sources. It's most important to make sure the fountain you choose is easy to use and easy to clean. 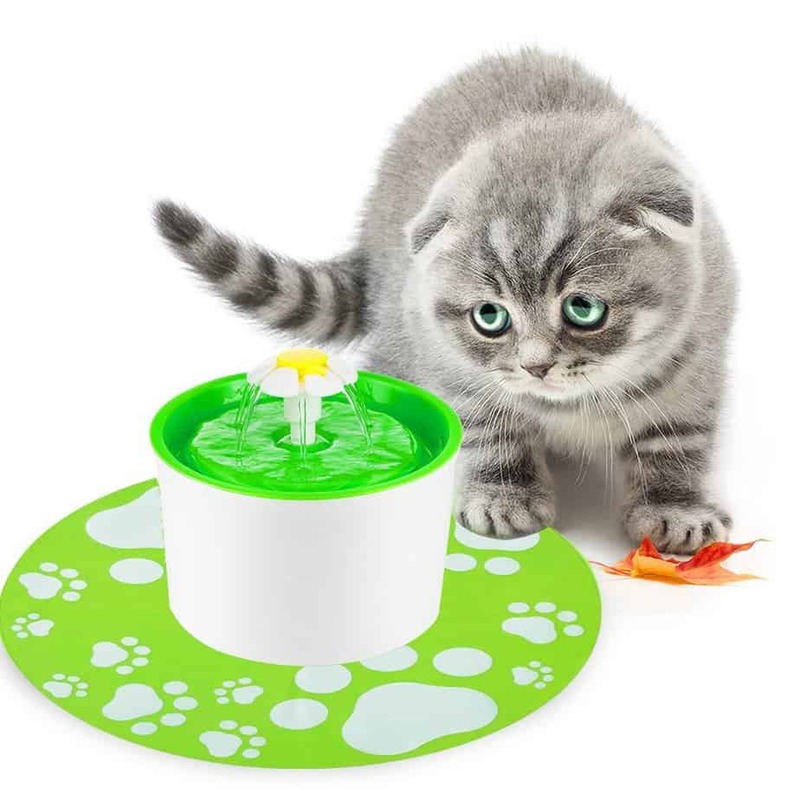 That means it's appealing and accessible to your cat, and that you'll be able to make sure the fountain is thoroughly cleaned so that no bacteria or other unwanted substances have a chance to form. Typically, it's a good idea to clean out the fountain you choose on a weekly basis. For some fountains, that might mean letting it go through the dishwasher while with others you may need to hand-wash. There's also going to be a difference in the amount of smaller nooks and crannies that you may need to get into. It's going to be a good idea to make sure you get something that won't give you too much trouble to keep clean. If you don't mind doing a thorough hand-clean with more complex water fountain then feel free to take that option. For those that prefer more ease, getting something that washes clean in your dishwasher is a great idea. As you clean, you'll also want to make sure you change out the filter as needed. This might be weekly in some circumstances or closer to bi-weekly in others. Keeping a fresh filter will ensure that your pets get clean, fresh water. Accessibility includes a number of things. Most importantly, it means having something that your pet will be able to get water from easily. Making sure it's in an ideal location, at a decent height will keep your pet from having trouble getting to it. This can also mean it needs to be appealing to your pet. For example, fountains that are running too loudly can discourage a cat from wanting to drink from it. Therefore, it's wise to find low-noise options that won't be disturbing to your pet. Not all cats are going to like the same kinds of fountains, as they can be quite picky about their water. When you first purchase a fountain, you should keep a regular bowl of water around as well and make sure to monitor which your cat prefers. That way, you can return the fountain if the cat simply isn't going to use it. In some cases, it can also just take a little time for your cat to adapt to using a fountain. Cleaning your fountain on a weekly schedule will help to make sure that no bacteria or fungus builds up. It also helps to make sure that your pet is getting fresh, clean water. If you go too long in between cleanings, then the filter may not be as useful because bacteria will grow within the drinking section itself. You can do cleaning and maintenance along with your cat house or the best cat tower to save time and effort. Make sure that the fountain is completely clean. If it went through the dishwasher, allow it to cool down before adding new water to it. If you've hand-washed it then rinse off any residue from the soap very well. It's important to treat the fountain the same way you would treat things you drink from. Depending on the instructions for your individual fountain, the filter should be changed out bi-weekly. If your fountain is outside or being used by multiple animals then you might want to consider changing it a little more often. The idea is to allow the filter to work at its best so that the water is fresh and clean. Because of the need to change out the filter, it's important to take a look at the prices of replacement filters for the fountain you're interested in to get an idea of the cost. In some cases, choosing a larger fountain that requires fewer refills might be able to save you a little money on buying more filters. In time, you'll be able to get a better idea for how often you need to change the filters in your fountain. There are a few reasons why the pump might stop working. The most likely option is that the water level is simply too low for it to work properly. In these circumstances, just refill the water to the max fill line and it should begin working well again within a matter of minutes. If the pump hasn't been cleaned enough, then it may be a matter of the pump becoming clogged with debris or pet hair. Try carefully cleaning out the debris and trying the pump again. If it begins working, then just make sure to clean it more often to avoid another buildup. If the pump still isn't working, then you may need to purchase a new one. Check with the manufacturer of your fountain to see if a warranty may cover the new part. Otherwise, order a new one and install it when it arrives, using a regular bowl in the meantime. Most often, this happens because the water level is too low and the pump is working harder to try to filter it. If you add more water, it should quiet down. If there is plenty of water in the container then you may simply need to unplug the fountain for a couple of minutes to allow it to reset. If you continue to experience a problem after you plug it back in, you may need to contact the manufacturer about the issue. Not all cats are going to like a water fountain, or the specific water fountain that you have chosen. Initially, it's a good idea to give your cat a little time to get used to it. If they continue not using it then you may need to try a different kind of fountain. In rarer cases, your cat may simply not be interested in a fountain at all. Unfortunately, there's no way to know how your cat will react to a new water fountain until you try it out. 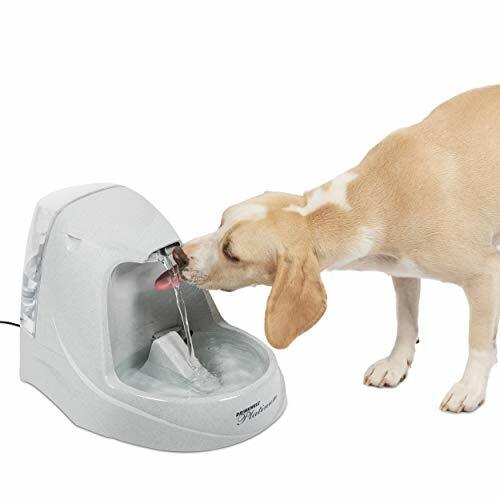 The Petacc Pet Fountain is the ideal option for those who want something easy that comes at a great price. 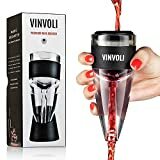 It has an excellent, aesthetically pleasing design that can go well with your pet décor and is also able to hold a lot of water so you won't have to worry about refilling it too often. DOUBLE GUARANTEE: Refund or replacement is guaranteed for our wine areator decanters. Risk-Free! 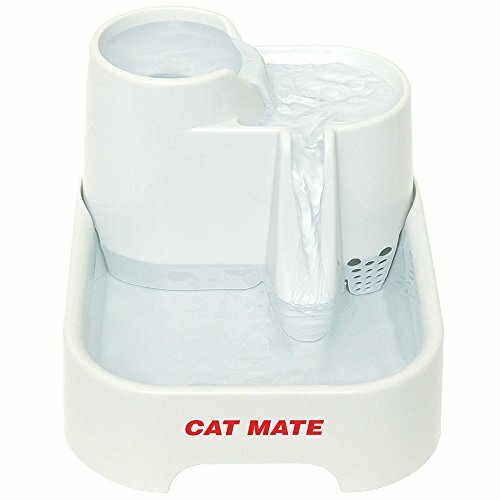 If the flowery design is too much for your taste, then the Cat Mate Pet Fountain is a great runner up with a much more simple design. It may not hold as much water, but it is a very straightforward option. Regardless of which water fountain you choose for your cat, you'll likely find a useful addition to your home that keeps your pet hydrated. You can also put this into consideration when looking for the best cat gifts for your pet. It is highly beneficial and kind of playful way to keep your cats hydrated.